Salty sea-spray must have christened her arrival. Lady Liberty, rising gloriously out of the harbor must have given her shivers. How Ann Durkin packed a bag and left the family farm as a young, single woman, how she mustered the courage to leave her whole world and face an unknown future, is a question my mom has always wondered aloud as she recounts the stories of her Irish grandma immigrating to the States in the 1920s. My mom always described her grandma has a brave, kind, strong woman – not unlike Ann’s mother-in-law, Bridget Nolan, who took care of six kids, losing one at some point, on the farm while her husband worked the mines in England. Both women were from a small town in West Ireland and they, with the handful of other women in our family tree who hailed from the same green spot on the globe, have been the enchanted subjects of my mother’s ponderings for as long as I can remember. The stories of the Old Country and our folk over there. Our roots. The task of assembling our Irish ancestry was a welcome (self-appointed) challenge for my mom and one she’s invested a lot in. So this trip was more for her than for me. Afterall, it was her family. So it was curiosity and an odd sense of obligation – for my mom, for the strong sense of heritage she has raised me with – that brought me to Ireland. She sent me our genealogy and family histories with pictures, which I printed and put in a little folder, tucked neatly in the back of my suitcase. She also forwarded me emails from our oldest living Irish relative, “Uncle Jack,” whose colorful descriptions of our ancestors had me intrigued to find some relic of our past. His advice was to “stop in the Pub and make [my]self and [my] connections known.” I chuckled when I read it – the world is a bigger place than it was back then. He wished me farewell sweetly and apologized for the ‘joke’ as I practically ran for the bus steps leading out into the wind and rain when the driver finally called “Swinford!” Slinging my rucksack over my shoulder, I crossed the main street to my hotel. This was in February. My first trip to the motherland. Nourishing a bad cold, I decided to leave my sleuthing to a short walk around town. My resolution furthered when I saw the fluffy hotel bed that I would have all to myself – no hostels in this corner of the world! Small town doesn’t even begin to describe Swinford. There are two main streets, both of which end abruptly – one with a bridge and a road to nowhere, the other with an out-of-place Tesco and another road to nowhere. For every barber shop and grocery store, there was a pub. Mullet’s, Moore’s, Davey’s, The Sheepwalk. Several pubs were attached to small grocery stores which I found almost too Irish to handle. 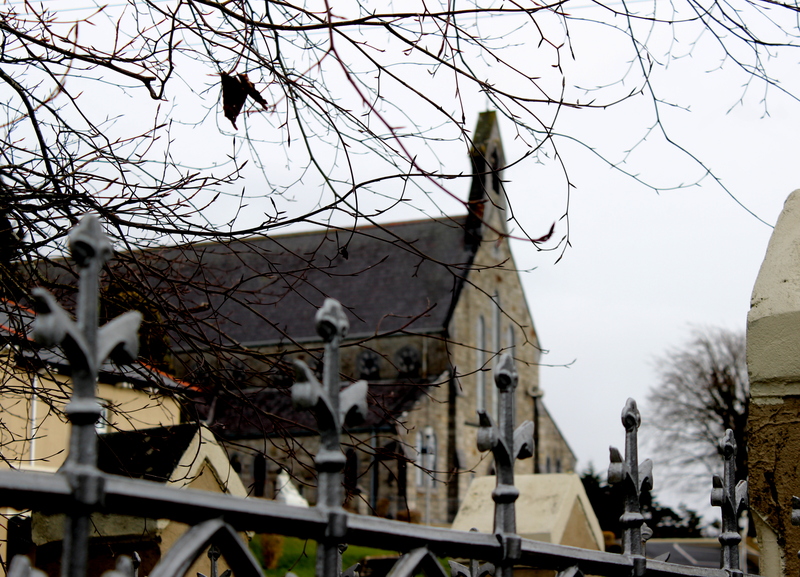 I walked to the foot of the large catholic church at the edge of town. Our Lady, Help for Sinners, was the name. Except for the Tesco, it’s about four times the size of anything else in town. I made a mental note to find out if this was the old town church that my great-great grandparents would have been married in in 1886. Despite some cough medicine and the very fluffy hotel mattress, I didn’t sleep well, and I woke up feeling worse than ever. Thankfully, the hotel offered a free Irish breakfast – and for those who don’t know what that is, it’s essentially every kind of breakfast meat in existence put onto one plate with a fried egg and some toast. I walked back to the church after breakfast and found a pew in the middle to occupy while people lit candles and said prayers, their coins chinking in the offering box. I said a prayer from where I sat, thanking God that the only price to come to him had already been paid. When the sanctuary cleared out, I stood up and walked to the front. I still needed to find the marriage records for the church, but this was definitely the only place in town where people would have gotten married. Standing by the alter, I pictured my great-great grandparents kneeling here, committing to a future together. No one seemed to be around to answer questions so I walked to the library (which I found by accident, because very few of my success are a direct result of planned efforts). The librarian was a fill-in and spent a lot of time apologizing for not being able to be of more assistance, but it wasn’t really his fault. The whole library could have folded in half and fit in a coat pocket. Their section on Swinford’s history was combined with the county history and it barely filled a whole shelf. I took all the relevant material to a table and sat down. Marriage records and baptisms were there for the church, but the years I needed were missing. Possibly the only useful information was from the Mayo County collection which mentioned that Durkin was one of the most common surnames in the area for nearly two centuries. Okay, maybe ‘useful’ is a generous word – it was encouraging to make a connection, small though it was, between my information and the county records. We pulled up the bus times and I made a mental note to go there on Wednesday if today didn’t pan out, cringing at the idea of another long bus ride. I explained my family quest and he nodded. I thanked him and he nodded at me before turning up his collar and hurrying away into the swelling rainstorm. 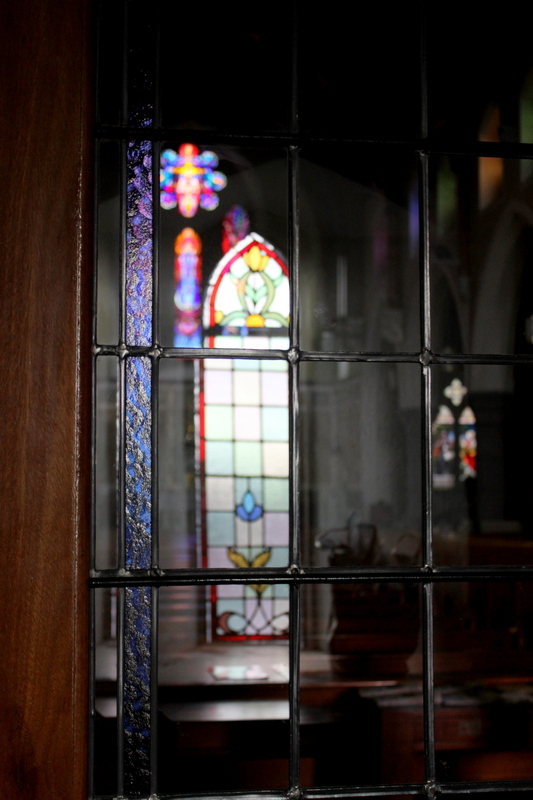 It took me a while to gather the brassiness required to knock on a strange door (which turned out to belong to the priest). Unfortunately, his secretary only showed family records by appointment and wouldn’t be in the next day. Disappointed, I wrote that one off as a failure. My online search of nearby cemeteries also proved fruitless, though the break from the wet wind in my warm hotel room was much needed. I was feeling sicker and weaker and the weather had taken a toll on my inner zeal for this mission. I hindsight, I think a lot of what I was feeling was also just exhaustion from a long year and a half away from home and a steadily nearing future that held as many questions as it offered answers. Even in February, with months between me and my flight back to San Diego, I knew I wasn’t ready to go home. I was tired. I was so tired of this walk up to the woods, knowing that the deep, dark forest was both unavoidable and unknowable. But with my graveyard search discouragingly unsuccessful and no more news from mom about possible leads, I examined my remaining options. It was exhausting pulling up so many loose ends. I knew I couldn’t make a trip to Castlebar today – it was almost three o’clock. I’d already used every resource I could think of in town. There was nothing left for it. I decided to walk to Ardlee. That was the one thing I knew for sure – I knew the Durkins were from Ardlee. I’d spent several hours identifying them on the online Irish census records, which I’d also sent to mom so she could aid me in the search from San Diego as I did the leg-work in Swinford. It was a beautiful kind of tag-teaming. According to our information – Uncle Jack – the Durkin home had fallen into disrepair. The Nolans I had been unable to locate, but Google maps told me Ardlee was straight(ish) up the road from Swinford, about an hour walk. I could do that today. Grabbing my camera and an extra coat (because being sick makes one feel a bit thin and elderly), I started down the main street, past the Tesco, into the great unknown. Few things are prettier than Irish backcountry, though several miles on the shoulder of a road can detract from the overall experience. It was muddy but I had boots. Wet, but I had a hood. Cold, but I had jackets – two, in fact. For a long time, I just walked. 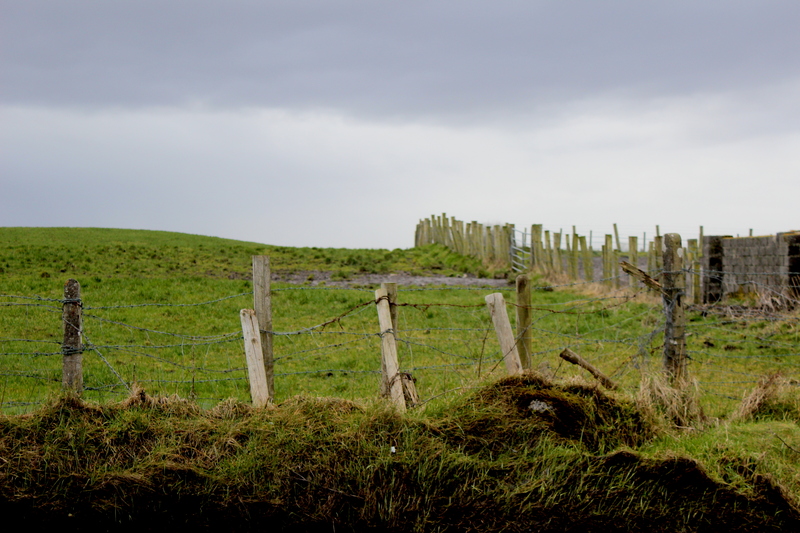 Past stone walls and grey-green fields that rolled out before my like waves in an ocean. One moment I’d find myself worrying about getting back before dark, not finding anything useful, even regretting the trip. The next moment my breath would be pulled from my chest as the incredible, hidden treasures of Ireland revealed themselves to me. It was a long walk. There were no road signs or house numbers, and all the farm houses were pushed too far back on their respective lanes for me to easily ask someone where I was. Ireland is a land of paradoxes. It rains all the time, sometimes fiercely and sometimes in dribbles. And yet, it’s crowning feature, those emerald fields, owe their existence to that much berated weather. I walked for nearly an hour before I realized how nice it was to do something so involving. The farther I went, the less I had thought about my own dark clouds and uncertainties. But my head was hurting and my throat was rejecting the cold air. Possibly worse, I was down to my last tissue. I wasn’t sure if I had made it to Ardlee or walked past it. I had no address to work off of and no map to get there. Signing this one off as another failure, I turned around. It was impossibly frustrating. I’d come all this way, done all this work. My mom had put in hours of research and sent me pages and pages of family trees and histories to help me and none of it had been any good. And the more time I spent in Ireland, the more I wanted to know these people that had once lived and worked and left this beautiful place. Catching my eye, just up the hill, I saw some sheep. My camera slept, hanging by the leather strap over my shoulder, mostly unused. Here was a chance to redeem the walk, at least a little. As I walked up the broken path towards the top of the hill, an abandoned farmhouse loomed into view. My pulse soared. There are few things I love more than abandoned buildings. I made friends with the sheep (they weren’t super interested in me when they realized I didn’t have food), and then I took several shots of that farmhouse. Looking back down the path, I realized just how high the hill was. A nice view of the surrounding valleys spread out before me. The camera now awake, I took picture after picture of the valley, the field on the other side of the lane. Everything. Then I walked further down the path for a few minutes for no reason, taking pictures of everything on either side. Several fields down the long slope I saw a collection of buildings. It was a sad reminder that I had still not found my destination and that it was getting dark. 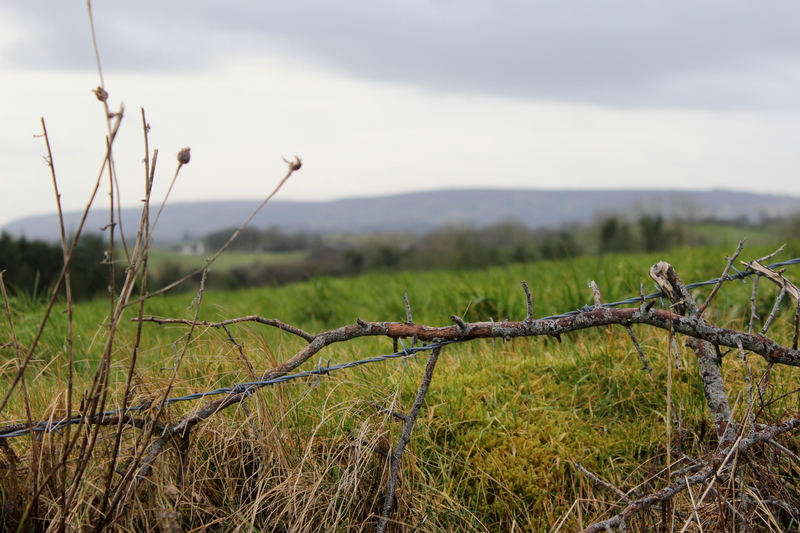 I put my camera away and walked all the way back to Swinford. Exhaustion tailed behind me like a lost puppy when I finally got back to my hotel. Peeling layers of wet clothes from my shivering shoulders, I sat down to write mom an update. When I checked google maps to see how close I had gotten to desired destination, I found out I had stopped a few fields short of Ardlee’s center region. I wanted to cry. Opening a new email tab, I explained to mom what I was able to find but it didn’t feel like enough. I felt like I had failed. I had come all this way, to the remotest, most isolated and forgotten corner of Europe, only to come up completely empty. The soccer match was playing in the hotel restaurant so I went down for a bite but retired at half-time. Resigning myself to the long trip to the Castlebar library tomorrow, I curled into bed, feeling thinner than paper. As I laid there with the agonizing thought that I had let my mom and Uncle Jack down, I realized how personally I felt the loss. I realized how much I wanted to know more about my family roots. I realized how much this trip was beginning to mean to me. I woke up the next morning, feeling (if possible) worse than the day before. I guess that’s not surprising, considering how far I walked in the wind yesterday. The thought of a bus trip to Castlebar almost kept me in bed, but the desire to eat food finally pulled me out. Two emails from my Mom waited in my inbox and I took a brief look before going down to breakfast. One was a cheery “Good morning,” with a suggestion that I stay close to town and not over-exert myself while sick. I’d done “more than enough,” she said. The thought was a comfort, a release from my obligation to be the ground operation to my mom’s years of research. But the game had changed. I needed these answers and, sick as I felt, it was killing me to have come so close and missed so entirely. The second email had the “addresses” for the Durkins and Nolans (which she finally found on the internet census). I was relieved that we had located them at last, but shriveled at the thought of making a trek on foot to wherever it was that they lived. I knew I’d do it. But I really wanted to just stay in bed. Breakfast as usual, then back to the computer to double-check Mom’s research. I confirmed the addresses on the census and then Google-mapped the area. Not that anyone will be surprised to hear this, but I burst into tears when I saw where they were. 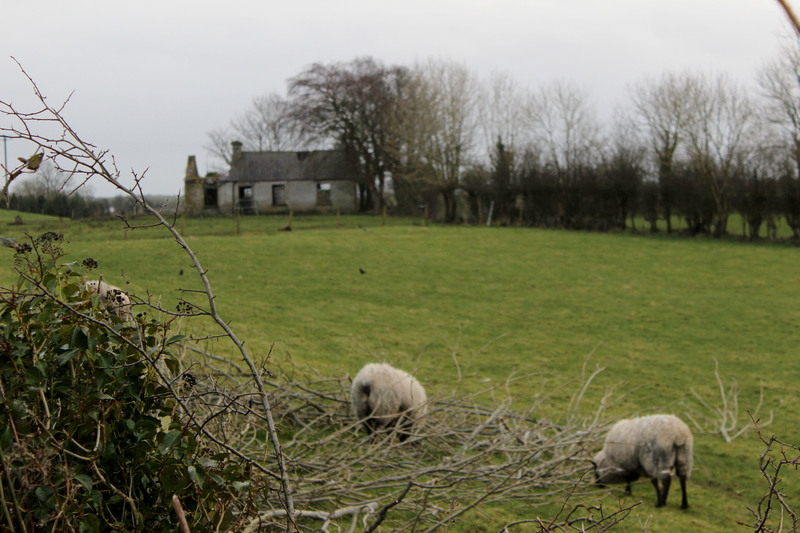 The Durkins had lived in the abandoned farmhouse I photographed right across from the sheep. The Nolans lived in the valley on the other side of the road that I took pictures of as well. I don’t know if I was happier that I wouldn’t have to walk all the way back there or just that I had found them – by a total, freak accident, I had found them. For maybe the next four minutes I just sat there and cried. Then I went back to bed and slept off the rest of the morning. That was the first part of my adventure. The adventure that got me started, you could say. The first chapter to a book a never expected to read. But even there in that hotel room, in my fevered haze, I knew I wasn’t finished. 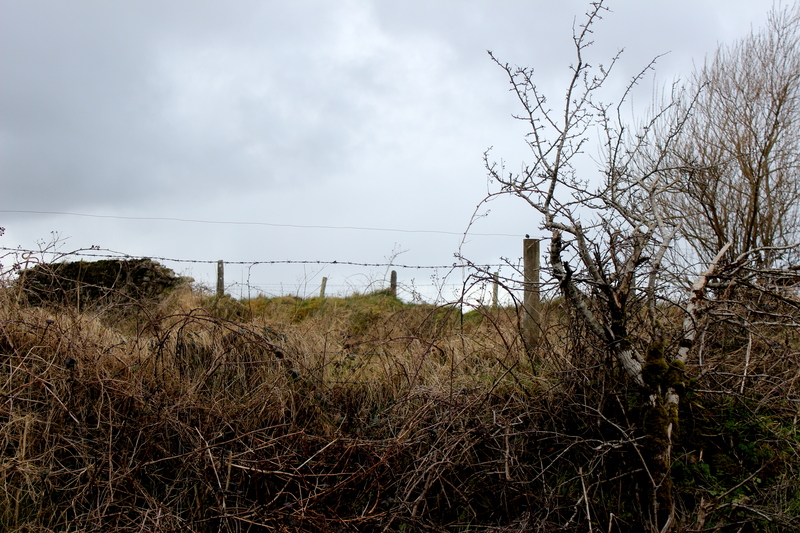 The most energy I could summon that afternoon was to walk to the Swinford cemetery on the hill behind the hotel. It started raining on my way back so I ducked inside The Sheepwalk, a small pub with the quaintest of patrons. A lovely afternoon and a conversation over the Golden Harp made me feel more deeply attached to this little town and its people that once were ours. The story should end there. I should have gone back to Prague, finished my time there, and then gone home. But I just couldn’t. 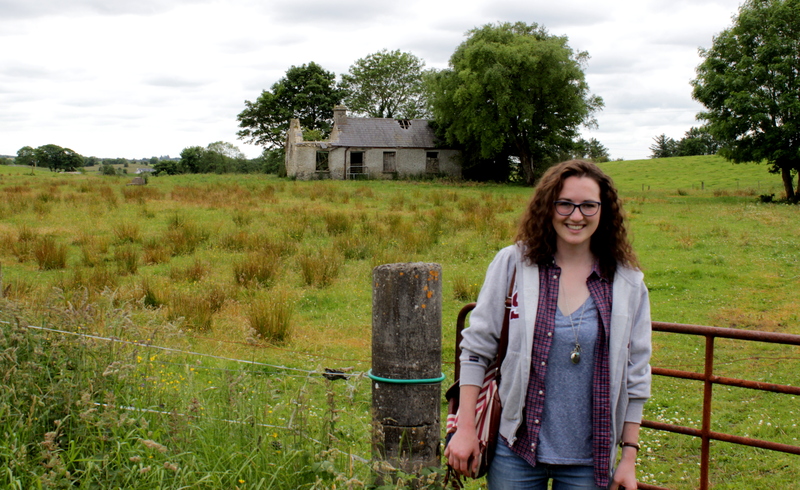 A growing itch inside me was drawing back to Ireland to find my family. To find out where I come from. So I managed to schedule a very long layover in Dublin on my way home and made one last, secret trip to Swinford. If I didn’t find anything new, no one would be disappointed, but at least I’d make it back there one more time. It was tricky finding a bus to get out there and return with enough time to make my flight back to San Diego and give me a long enough stretch in Swinford to do anything useful. Finally I decided I’d just return to the abandoned house. I’d get some good pictures, maybe bring back some kind of keepsake. My bus rolled into Swinford at 10:38 on Wednesday morning and my first stop was to the gifts and cards shop for some breakfast items. Milk, muffin and banana safely bagged, I found my way through Swinford’s lovely back streets to Deerpark Manor B&B. For those considering a trip to West Ireland, Deerpark would be my official accommodations recommendation, so sweet were the hosts (a family by name of Maloney) and so cozy and quaint the rooms. The whole house was furnished in a turn-of-the-century style with velvety red carpets, black-and-white tiled floors, and paintings and photographs of Irish history. Despite arriving three hours before check-in time, I was given keys to my room immediately where I sat upon the floor and at my little breakfast. Following a shower and a nap, I decided it was time to start the three-mile trek back to Johnsfort in Ardlee, to the little, abandoned homestead. In the kitchen I asked the Maloneys which direction to Ardlee and they looked at me surprised. On foot? I should take a taxi. In fact, they said, the taxi man was from Brackloon and would know people there. Who was I looking for? Oh, Durkin – there are lots of Durkins in this area. Good family name. Could I wait a moment? They’d just get the cabby on the phone. The cab driver turned out to be a man by the name of O’Brien. He was a cheery fellow who kept insisting that he wouldn’t “rob me.” After setting off down the road, he called up his wife. “What’s needin’, dear?” came her delightfully thick Irish accent. “Yes, there’d be lots,” came the crackly response over the car speakers. “But would she be looking for them from Ardlee or Johnsfort or…” the rest of what she said was lost in static and the depths of her sweet brogue. Johnsfort, I knew, was what we wanted. After calling his wife, he called a few neighbors and friends, looking for who owned the plot in Johnsfort. Finally, we pulled up the drive of a home owned by a man named Vincent, a gent in his sixties who knew a Michael Durkin quite well and now owned the abandoned house by the sheep. He and I walked across the field to get a look at it while O’Brien raced back to town to pick up a client. The old farmstead hadn’t changed at all since my trip in February, though upon closer inspection I was finally able to see chipping blue paint on the walls inside, the bare rafters ornamented with a large bird’s nest, and the broken and rotting wood littering the floor. Vincent told me who the house had belonged to last and where they were now, and who lived in the fields across from them (Nolans – also a possible relation, based on Uncle Jack’s stories). He questioned me about my family tree and I kicked myself for leaving all those genealogy papers I’d brought the first trip in my hostel in Dublin. If this was the place, this farmhouse was Ann Durkin’s home. This small little house was where her mother gave birth to thirteen children. This door is where she would have walked out to get the train to Dublin and then a boat to America. This familiar road would have taken her to an uncharted future, an unknown life, a new world. “It’s good to know where you come from,” Vincent said to me, observing my gaze at the crumbling house. O’Brien dropped me off in town and, true to his word, didn’t “rob me.” I made my way to The Sheepwalk bar in search of familiar faces and a touch of wifi. The barman, Matthew, from my last trip greeted me with a “Hey there,” as if I’d been in yesterday. The stools were half-filled with people I didn’t know, but I plopped myself down in the middle and asked for a Guinness and the wifi password. For a while I just listened to the cheerful Irish banter while I searched my emails for some of mom’s family histories, trying to piece together the information Vincent had given me. “How’s he doing there,” someone asked Petey as his anxious eyes glued themselves to the TV screen playing the horse races (Petey was here during my last trip as well. He remembered me too and gave me a little nod and a ‘how’reya?’ before turning back to the race). “Sure you would,” jabbed a patron with twinkling eyes. Someone finally asked me what brought me to Swinford and then what family names I was looking for. This ritual was repeated every time a newcomer would venture into the bar and ask why there was an American occupying a seat in this emptying corner of Old Ireland. And everyone knew everyone. The whole pub went quiet. “We are now,” said someone else. The jolly lady took to the task of teaching me Irish slang while the others bantered back and forth and the old man next to me rocked softly on his stool. “Right, a gobshite’s like an idiot,” she explained. “Need a translator for you, we do,” someone said. A pen and paper were produced and I began scratching out the vocabulary lesson that was now coming from each of the patrons. “You know, it’s hard to think of them on the spot,” said one man who’d just come in and was getting started on a pale ale. I was mid-word when the langered old man beside me took my pen and began writing. I was dumbfounded. No numbers on your postal addresses? This explained why there were no numbers or street signs when I’d gone searching for the Durkin home in February. And what a miracle that I’d found it at all. I guess Uncle Jack had been right – just show up in a pub, introduce yourself, and Ireland will do the rest. 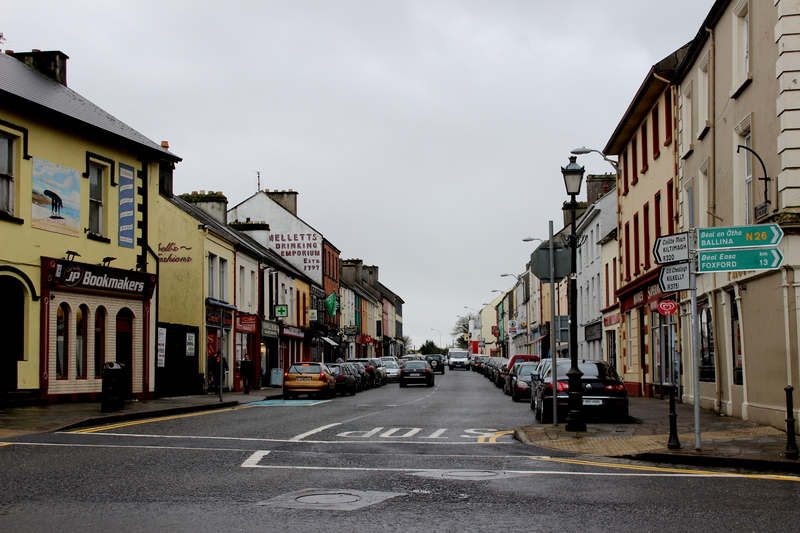 The community of Swinford was seeming more real, more touchable and yet even more unbelievable to me the longer I stayed there. 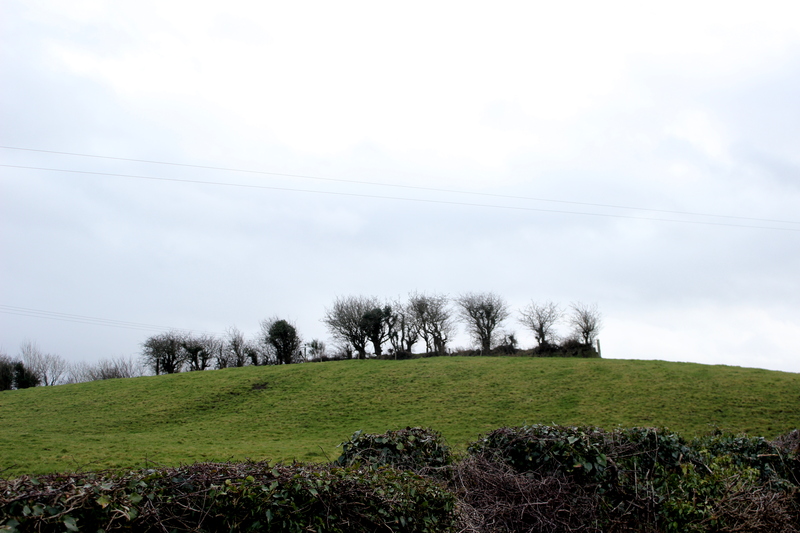 And so, it was with my favorite patrons at The Sheepwalk that I drained away my last afternoon in Swinford. I left with numbers of people in town who might have more information for me and when I returned to Deerpark Manor, O’Brien had left me a message with the number of a woman to whom I might be related. I gave her a call and we chatted for a bit, both promising to stay in touch and continue to do research. My bus back to Dublin was at 1 o’clock, so after checking out of my room, I walked to Mellet’s (est. 1797, seventh-generation owned) for a quick drink. I’m not much of a drinker, but I’m learning that few things are richer than Irish banter. The same round of questions waited for me as I settled in on a bar stool. Everyone knows a Durkin. Everyone thinks they know a Moran. Everyone agrees that Nolan is a local name. Everyone wants to know where I come from in the States. In fact, everyone seems to know everyone else that I’ve talked to in the last 24 hours, from the Maloney’s to O’Brien to Vincent. This is small town at its finest. And it’s starting to feel like my small town. Like a piece of me, no matter how small or how far removed, really and truly belongs here. “And this here at the top is how you say it in Irish,” they explained. Now I had a keepsake to bring back to my mom. All too soon I had to hurry away to my bus. It was a long way back to Dublin – nearly five hours. I still didn’t feel ready to go home. Mostly because it doesn’t really feel like I’m going home. It feels like going into a future I’m unsure about, down a path I can’t see the end of. It feels like leaving a place I’ve come to know and love as much as I know myself. Prague has been more than just an adventure. I’ve built a life there, hoped for a future there. And leaving has been one of the hardest things I’ve ever had to do. But as my bus rickety-clicked its way across Ireland’s Green, I wondered if maybe this is how Ann Durkin felt as she prepared to go to America. Maybe she had these same fears nestled in her heart, squeezing the breath from her lungs, lighting the fire in her soul a century before me. I’m glad I discovered Swinford. Glad I found out more about where I come from, the people whose stalk I’m made of. It’s not that I suddenly know myself better, only that I suddenly know better two things. The first being that there are incredibly strong, brave women in my family – not the least of whom is my own mother. The second being that God’s story of human history is woven with the most mysterious array of colors and patterns and what we see as endings and losses most often become incredible beginnings and gains that affect generations long after our own have been laid to rest. And so, knowing where I’m going seems to matter less as a confidence and pride brightens my spirit, birthed from the knowledge of knowing where I’m coming from. On Tuesday we had to say ‘Goodbye.’ For some of you, this was easy – you were excited about the next step of your lives, your summer plans, or even just getting home for lunch. For some of you, the last day of school was tougher. You were torn between a past that you loved and a future you’re unsure about (no matter how excited you may be for it to come). And then, not all of us got to say ‘goodbye,’ did we? That happens too. For me, the hardest part of the day was walking down the first floor hallway for the last time. You know the one – it runs along the ninth grade classrooms from the lunch hall to the big staircase at the end of the school. All those big windows let light come washing onto the smooth floors and across your lovely picture boards. I’ve been dreading that walk for a year and a half. I go that way every day after lunch to get to my office. Really, the day I realized how hard it would be to walk through this hallway on the last day of June was the day I realized how much I was falling in love with you and your school. But the day did have to come and, even though you’ve already moved along with your summer plans, I want to say just a few things. Think of it as one last little piece of love from your teacher to help you through the next few years. I know Mondays are hard and it’s easy to be glum when you get bad marks or lose your phone (or someone hides your phone and doesn’t say where! . . . Honzo. . . ). But smiling is a way to fight back. Happiness is not something we find, it’s something we make. Smiling – even when you don’t really feel like it – is the first step. And I think you’ll discover that if you smile at people, they’ll smile back. That’s called human connection and we don’t do it enough. But more importantly, your smile will have an effect on those around you. Your smiles have gotten me through some really difficult days. The person I am today is made up of tiny pieces of the people you have been for the last two years. You have shaped me by our shared experiences and you’ll continue to shape those around you for as long as you live! We humans share this planet and we will influence each other, for better or for worse. Remember that and decide: how do you want to shape people? If all you ever give the world is a smile every day, it will be a brighter place. This one is tough. Being kind isn’t easy and it isn’t glamorous. It certainly isn’t cool. But you know what? It is one of the greatest things you will ever learn. Learn to be nice to people you don’t like. Learn to keep quiet when you want to say something funny at the expense of someone else’s feelings. Learn not to laugh when a friend is down, no matter how funny it might seem to you – help them back up instead. I know this might sound boring to you. It’s not. Kindness is both a gift and an adventure, and only the bravest will ever know its fullest depths. It is the most underappreciated form of goodness and heroism that exists. There is no glory in being kind – only the reward of helping another person. And that is enough, trust me. We can all agree that not every lunch in school is a good lunch. I particularly struggle with the fish dishes. Gag. But someone made that food. Someone paid money so that you could eat it. And someone much hungrier than you is going without lunch at all today. This isn’t meant to make you feel guilty, only to remind you to appreciate what you’ve been given. Appreciation is something you’ll struggle with your whole life. Start now. Start by thanking God for food to eat, friends to eat it with, and a school to eat it in. The best part about this is that the more you appreciate what you have, the fuller life will seem to you. Richness and joy will leak out of every mundane activity and colorless possession and you’ll discover an entire world that most people will never notice because they never learned appreciation. Duh. Turn in your homework. Study for tests. Get good marks. But hard work won’t do you any good if you’re not doing it for a purpose. And I don’t mean, “Mom is happy when I have good marks,” or “I need to get into a good high school.” Work hard because you can. What a gift it is to learn! What a privilege it is to fill our minds! God has given us the most amazing capacity to grow and expand! It can be a struggle and you won’t always win, but I want you to try. I want you to aim to grow yourself into the brightest, smartest, hardest-working person you can be – but don’t do it for me! Do it for yourself. Do it because you owe your humanity the very minimum respect of cultivating your mind, body and soul to the best of your ability. I’ve seen some of you quit. I’ve seen you come to a wall that you didn’t think you could climb. Can I tell you something? Watching you give up on yourselves is the hardest part of my job – worse than grading papers (or losing students on the metro. . . Petře. . .). Thomas Edison (inventor of the light bulb) once said, “I didn’t fail – I found a thousand ways not to make a light bulb!” And after thousands of tries, he finally succeeded. And all those failures added to his character – they made him a stronger person. The key is to keep trying, because, ultimately, our greatest successes are not what we accomplish but who we become. Become someone who doesn’t quit. Don’t give up on others. There have been a few times in the last few years when I’ve thought, “I’m not meant to be a teacher – I can’t do this.” (One of these times may definitely have followed the ping-pong incident). Do you know why I didn’t quit? Because you wouldn’t let me. Every time I got worn down, you picked me right back up. We need people to believe in us. We need to believe in others – and not just with things like school and work! Growing up is hard and we all make mistakes. Be patient with your friends. Forgive. Forget. Work together. Don’t give up on those around you who are struggling to find themselves – and I mean everyone, not just our friends. Everyone. Our faith in humanity is much too fragile. Learn to sympathize, learn to respect the struggles of others, learn to lift people up. Leaving school has been one of the hardest things I’ve ever had to do. It breaks my heart to go. A lot of people have been asking me, “When will you come back?” And the truth is, I don’t know if I will come back. Who can know the future but God? On Tuesday, when someone asked me when I’d be coming back to Prague, a dear teacher took my face in her soft hands, looked me in the eyes, and said, “Your life is ahead of you.” I needed to hear that. I needed someone to tell me that it’s okay to say ‘goodbye.’ Love and friendship are not bound by space and time. So follow your road. Go where you need to go. The people who love you most will be waiting for your return or simply praying for your safe journey, wherever it takes you. I want to thank you for letting me into your school. You can’t know how I scared I was when I first came to Prague. I didn’t understand anything anyone said. I wasn’t used to the rules and customs here. And I kept getting lost on the stairwell! Most of all, I was scared of letting everyone down, of being a bad teacher. 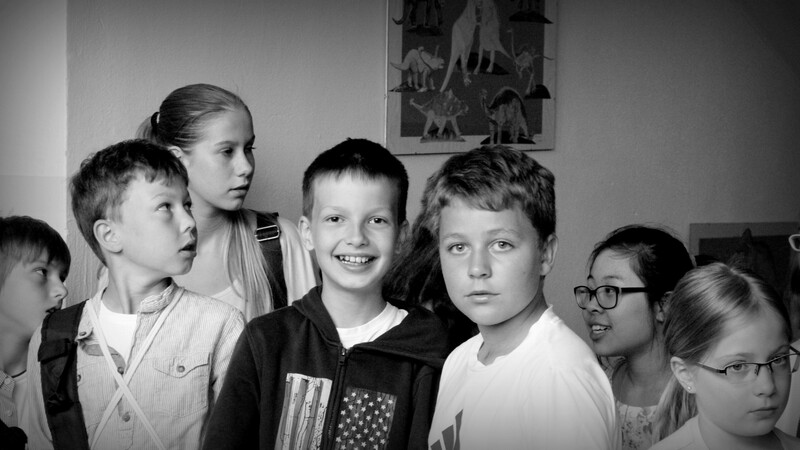 Nebyla jsem špatná učitelka, žejo? I could not have made it through the last two years without your help. You have been so kind to me. You have been so much fun to work with. And you believed in me when I didn’t believe in myself anymore. If anything, you were my teachers and I was your most adoring student – and I always will be. I want you to know that you have been my greatest adventure. I also want you to know that it’s okay to love your new teacher the way you have loved me. People come and go – that’s life. But there is no end to the amount of love we can give. Don’t let the pain of an ending keep you away from the beauty of a beginning. All things do end, eventually. Keep your heart open for whoever needs a home there. And be ready to love everyone – no matter where they come from or where they’re going. It took me less than 90 seconds to walk from one end of that hallway to the other. The school was quiet – the way it is in the afternoon when you’re all tucked away in your last classes of the day and everyone is sleepy from a full lunch. For that 90 seconds, I thought about all my favorite moments in this school. The first snowfall, Halloween, learning our Christmas songs, the Garden Party. I thought of all your little triumphs and all your dreams, your fears and hopes and crazy ideas – pieces of yourselves that you’ve given me. What an honor to have been your teacher! But before I knew it, the hallway ended. The view around the corner spread out before my eyes and, looking backwards, the hall lay still and silent. Life happens quickly. It’s over before we know it. Don’t waste a moment, don’t miss a beat. Remember that you won’t always have the chance to say ‘goodbye,’ so live each moment expressing your love for those around you – let there never be a doubt in their minds how much they mean to you. I hope, I hope, I have been able to express just how much you have meant to me. But above all, don’t be afraid. The world needs brave people who will be kind, fair and loving.